What does it mean to be “in love up to the elbows”? Why is the earliest known English song complaining about the weather? Why did followers of the Virgin Mary get bladdered “for Our Blessed Lady’s sake”? How could Henry VIII write such a beautiful love song while being so vile to his wives? And why didn’t he write Greensleeves? Why was a well-known Christmas song never sung at Christmas? Why was farting so enjoyable in the 17th century? If you’ve ever wondered about these questions – and, let’s face it, you probably haven’t – then you can find the answers to these and other questions you’ve never considered in The Night Watch’s show, Musical History Tour. 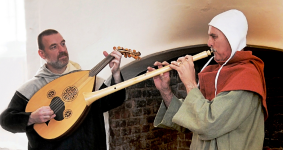 Taking you on a journey from the 12th to the 17th century, their whistle-stop tour of musical history stops only to pick up their period instruments. Andy Casserley bows and blows, Ian Pittaway plucks and jingles, and between them they’ll sing and play recorders, lutes, shawms, gittern, rebec, oud, crumhorn, cittern, pipe and tabor, 4 course guitar, cornamuse, orpharion, gemshorn, bagpipes, simfony, trompette and percussion. You may even be surprised to hear the earliest known versions of songs and tunes you’ve heard in your local folk club. In between pieces, The Night Watch will tell you a bit about the songs, the tunes, the history and the instruments, and there’ll be a chance to have a closer look at reproductions of instruments you may never have known you wanted to play.